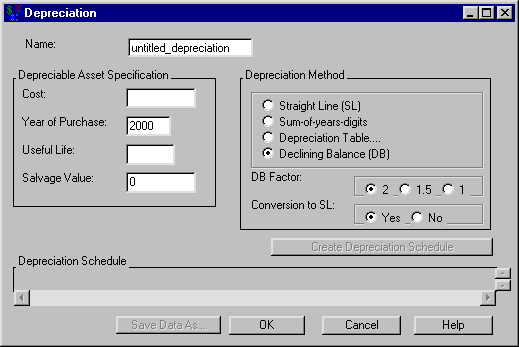 Selecting Investment New Depreciation from the Investment Analysis dialog box’s menu bar opens the Depreciation dialog box displayed in Figure 56.29. Name holds the name you assign to the depreciation. You can set the name here or within the Portfolio area of the Investment Analysis dialog box. This must be a valid SAS name. Cost holds the asset’s original cost. Year of Purchase holds the asset’s year of purchase. Useful Life holds the asset’s useful life (in years). Salvage Value holds the asset’s value at the end of its Useful Life. Create Depreciation Schedule becomes available when you adequately define the depreciation within the Depreciation Asset Specification area. Clicking the Create Depreciation Schedule button then fills the Depreciation Schedule area. Start Book Value is the starting book value for that year. Depreciation is the depreciation value for that year. End Book Value is the ending book value for that year. Print becomes available when you generate the depreciation schedule. Clicking it sends the contents of the depreciation schedule to the SAS session print device. Save Data As becomes available when you generate the depreciation schedule. Clicking it opens the Save Output Dataset dialog box where you can save the depreciation table (or portions thereof) as a SAS Dataset. OK returns you to the Investment Analysis dialog box. If this is a new depreciation specification, clicking OK appends the current depreciation specification to the portfolio. If this is an existing depreciation specification, clicking OK returns the altered depreciation specification to the portfolio. Cancel returns you to the Investment Analysis dialog box. If this is a new depreciation specification, clicking Cancel discards the current depreciation specification. If this is an existing depreciation specification, clicking Cancel discards the current changes.